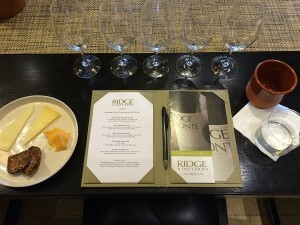 Our visit to Lytton Springs stemmed from a blog I had written about the 2008 Ridge Vineyards Lytton Estate Syrah Grenache. I had written the blog and before I had reviewed and edited the blog, I accidentally released it. 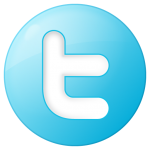 Every blog that is posted on Facebook is posted to Twitter. Well, before I could fix the blog there were people on Twitter that “favorited” the story. After a couple more “favorites” Ridge started communicating to me. They liked the story. 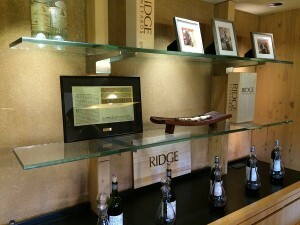 I mentioned we would be visiting Healdsburg the upcoming weekend and Ridge invited us to a tour and tasting. Obviously we took Ridge up on the offer and scheduled the tour that Saturday at 11am. 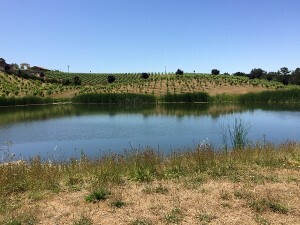 The Lytton Springs Winery and Estate is located near Healdsburg in the heart of zinfandel country. The estate is a sustainable, photo-voltaic (solar) powered winery. We arrived minutes before 11am. The facility opens at 11am so we waited anxiously for them to open the facility. The weather was picturesque as usual. Bright blue skies with not a cloud present. The temp’s in the seventies already. It was going to be another hot day in the Dry Creek area. We entered the tasting room and was greeted by people in the hospitality area. Nate was going to be our host today. 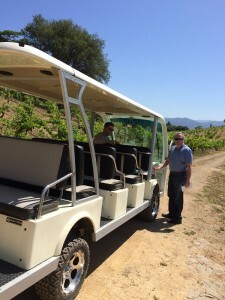 After a brief conversation we left the tasting room heading to a small vehicle for the 90 minute private tour and tasting. Our personal tour had taken us through their century-old vines called a mixed-vines vineyard. Some of the vines were planted in 1901 and 1910. There are twenty-five varietals (75-80% are zinfandel). The row and vine spacing is 12 x 12 allowing plenty of sunlight and not a lot of competition for water and nutrients. 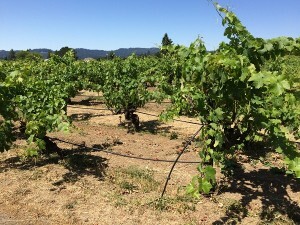 The vineyard is mostly dry farmed and they use limited drip irrigation. On top of the hill during the tour, we stopped and walked through the vineyard while Nate discussed the history of Ridge and Lytton Springs. 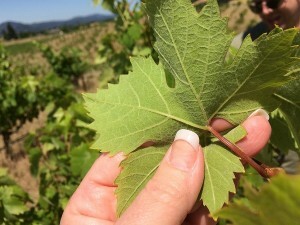 One thing I learned while in the vineyard, the back side of a Zinfandel leave feels just like velvet. If you get the opportunity to feel one do it. On the drive back we drove next to the estate lake. When the vineyard needs water they pump from the lake. Another key element when becoming eco-friendly. As we returned Nate also pointed out how the building was made using straw bales and vineyard clay. 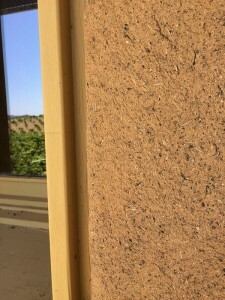 The straw bale walls allow the building to breathe keeping the utilities low. 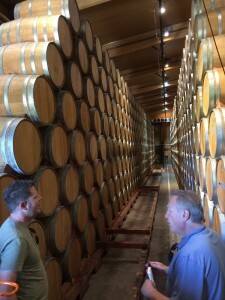 The final part of the tour was inside in the wine production facility and barrel room. The wines fermented at this estate are all natural. The winemaker does not inoculate the juice with any yeast or Malo-lactic bacteria. All of the barrels are made from American Oak. 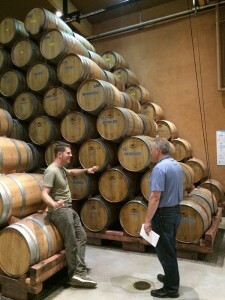 The barrel room is humidity controlled with a constant temperature of 50°F. I found the way they stacked the barrels during storage quite interesting. The are stacked eight high and are only moved when they need to be replaced. I can only imagine the hours it takes to replace barrels. Our tour of the estate ended with a private tasting in a room that resides upstairs with large glass facing the tasting room. 57% zinfandel, 42% carignane, 1% petite syrah. 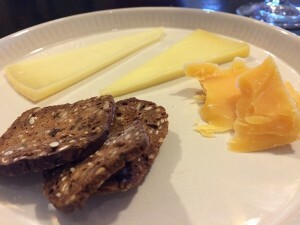 The Lytton Springs Century Tour & Library Tasting costs $40 per person. The tour lasts 90 minutes so plan accordingly. 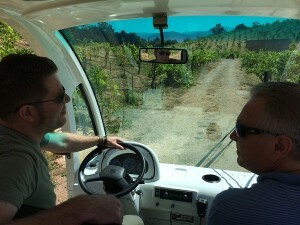 The overall tour and experience was great, we both rated it five glasses. 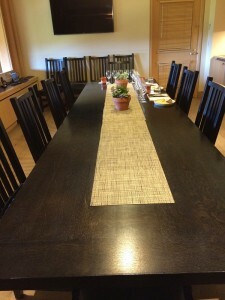 If you are in Healdsberg, I would recommend the tasting and tour.